Whether or not guests are from the New Orleans area, there is something to interest everyone at the Historic New Orleans Collection. From jazz history to original Tennessee Williams manuscripts, a few hours here will inspire even the most hesitant museum visitor. 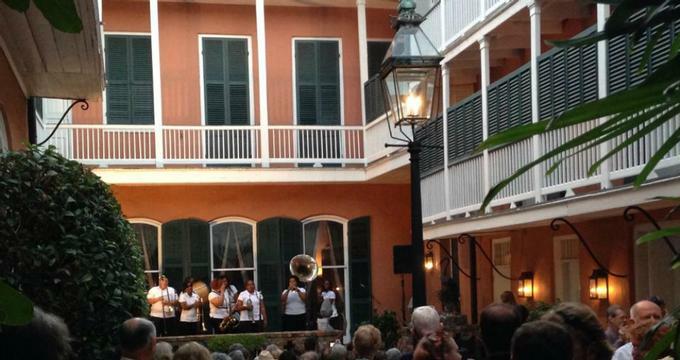 Originally established in 1966, the Historic New Orleans Collection (or HNOC for short) now encompasses over 10 historic buildings in the French Quarter. The collection was based on and inspired by General Kemper and Leila Williams, the original owners of the property that now houses the Merieult building, and their large collection of Louisiana materials. A foundation to honor their contributions to preserving the history and culture of Louisiana was established, eventually becoming the HNOC. Since that time, it has expanded into a full research center as well as publishing many journals and books on their rare collections. Although the collection features many rotating and temporary exhibitions, the permanent exhibitions are also must see for anyone visiting the collection. Below are a few highlights, although visitors should allow plenty of time to see everything. Williams Research Center - Everything available in the research center is accessible to the general public. This means that their over 30,000 items, roughly two miles of manuscripts and documents and half a million photographs, paintings and 3D items can be seen by anyone who walks into the center. The collection also features a large variety of maps of Louisiana that show how much it has developed since it was originally founded and discusses that development. Tennessee Williams collection - The single largest collection of Tennessee Williams manuscripts (such as an original copy of A Streetcar Named Desire), playbills, and typescripts among other memorabilia anywhere in the world. Come browse the collection and be immersed in one of the greatest playwrights ever known. War of 1812 collection - Focusing on the Creek War and the Battle of New Orleans, as well as Andrew Jackson and his important role in the conflict, guests browsing this collection will be surrounded with original documents from the time period. Archives from the Sugar Bowls - After Hurricane Katrina damaged the Superdome where the archives were originally held, the collection was moved to the New Orleans Collection building. German settler archives - Paying tribute to the many German settlers that called New Orleans home, this collection contains many photographs, maps, sheet music and historic manuscripts and lineage documents from many of the original settlers. Jazz collection - Featuring a large collection of musical instruments, sheet music, photographs, and books, the William Russell collection walks visitors through the origins of jazz music in New Orleans and how it impacted the city. Learn about “Fess” Manetta, “Jelly Roll” Morton and more! Museum buildings - Visit the Merieult and Williams homes, both built in the 1800s. The Merieult residence was built on land that traces back to the 1700s, and the Williams home is much the same and remains furnished as it was in the 1940s. Both historic buildings house some of the collections and offer daily tours. School field trips are offered free of charge to the Historic New Orleans Collection. There are a variety of options, included tours lead by a docent as well as self-led tours, special access and presentations, all meant to help students engage with history. Teachers should make sure to fill out the online form to reserve a date and time with the museum, at least two weeks in advance. There is no food or drink allowed on museum premises, but there are a variety of local parks available within walking distance to take the students to either before or after their visit. It is recommended that teachers talk about appropriate museum expectations and behavior with their students prior to arriving. Most importantly, there is no running, loud voices or touching museum collection items while inside. One adult chaperone is required for every ten students. These chaperones must be present at all times and in control of the students. There is a gift shop available offering stationery, books, home goods, jewelry, and more. Many of the items offered have been published by the museum collection itself. Guests should make sure to stop by on their way out, especially if they have been inspired by anything they saw while in the museum. Reproductions of many of the art pieces on display are available for purchase as well.